The Time Management Sheet is here to save you the most valuable thing in the world, some extra time. You’ll plan out everything you need to do much more quickly and efficiently with this free template. If you have all the ideas locked away in your mind but usually forget them when you need them most, this template is for you. You can capture your schedule and any ideas you have for improving work, school, or your daily life through this simple template. See more information by reading the instructions below. The thing you need to do is download the template, you kind of need that. To download the template, just follow the link provided at the bottom of this page. The Management Sheet splits your day into convenient colored tables. Find your current day and start from there. To the right of the template, you will find times of the day as well. You will change these according to your unique schedule. Just click the cell or cells you want to change and type in a new time. Once you have your normal hours for that day up and ready to go, just go back to your table. At the top of each table, you will notice different time slots. These are used to break down each hour for every 15 minutes. This free template also includes an extra section off to the side to add any helpful notes you want to list in general for the week. 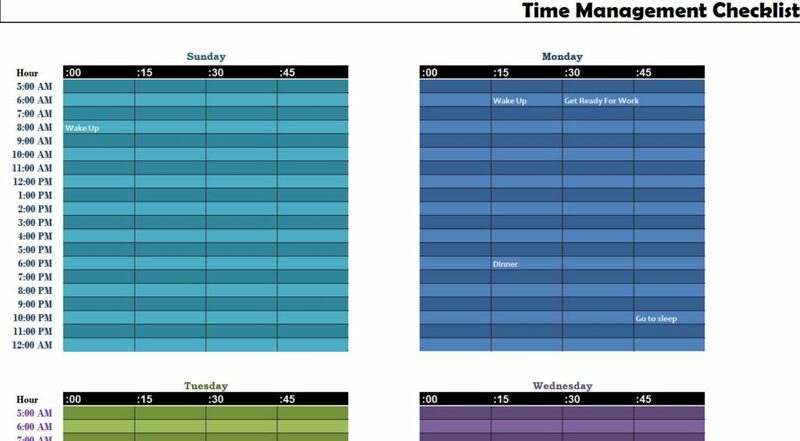 It’s easy to see how quickly you can organize your daily schedule using the Time Management Sheet.